About the only thing Kabang didn’t have upon her release Monday from the University of California, Davis, veterinary hospital was a cape with an oversized "S” on the back. The dog, deemed a hero in her native Philippines and worldwide for head-butting an oncoming motorcycle out of the path of two young girls, is expected to fly home Thursday after spending nearly eight months in the United States for treatment of her gruesome injuries and unrelated illnesses. 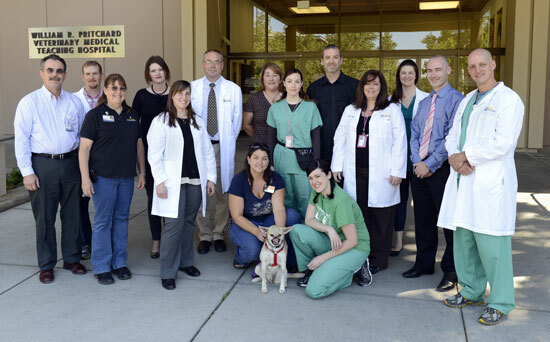 "Kabang’s care at the teaching hospital was a great example of the synergistic approach we have toward veterinary medicine at UC Davis,” said team member Frank Verstraete, DrMedVet, Dipl. AVDC, Dipl. ECVS, Dipl. EVDC. "We were able to treat all of the complications that arose with the best specialists available,” added Dr. Verstraete, chief of dentistry and oral surgery at the William R. Pritchard Veterinary Medical Teaching Hospital. Kabang’s snout and upper jaw were severed in the December 2011 accident. When she arrived at UC Davis 10 months later after a fundraising campaign launched by Buffalo, N.Y., resident Karen Kenngott, the veterinary team discovered other medical issues, including heartworm and a transmissible venereal tumor. Kabang is joined by her UC Davis veterinary team in front of William R. Pritchard Veterinary Medical Teaching Hospital, where she spent much of the past eight months. Treating her primary injuries entailed extracting teeth and reconstructing an eyelid and nostrils. A five-hour surgery March 27 closed Kabang’s facial wound with skin flaps brought forward from the top and sides of her head, UC Davis reported. Following that procedure, Dr. Verstraete and Boaz Arzi, DVM, Dipl. AVDC, collaborated with William Culp, VMD, Dipl. ACVS, to reconstruct nasal openings and insert stents to allow two permanent nostrils to form. "The surgery was long but went just as planned, in large part due to the collaborative nature of Kabang’s veterinary team,” Dr. Arzi said. Kabang was given a clean bill of health May 28. Now free of heartworms and with her vaccinations up to date, the 25-pound mixed breed received a U.S. Department of Agriculture health certificate required for her return to the Philippines. During her saga, Kabang’s story was reported worldwide. She received Lassie-level well wishes, including 23,000 "likes” on the Care for Kabang Facebook page. Among her Facebook supporters was owner Rudy Bunggal, who on May 22 posted a message thanking "from the bottom of my heart” Kenngott, the veterinary team and donors who paid for Kabang’s travel and treatment. The UC Davis team included specialists in dental, oral and soft-tissue surgery, oncology, infectious diseases, internal medicine and outpatient care. "We are so appreciative to Rudy Bunggal and his family in the Philippines for entrusting our veterinary team with their precious dog over these many months,” said hospital director David Wilson, BVMS. Wilson also acknowledged the contributions of two Filipino veterinarians—Anton Lim, DVM, and Ed Unson, DVM—and Dawn Gillette, RVT, who cared for Kabang at her animal convalescent center near Woodland, Calif.